My friend (“The Pugilist”) is planning to visit St. Seraphim Orthodox Cathedral in Dallas. This is the preview I gave him. – Praying along with all the prayers is the norm, even with most of the prayers that are said by the Priest or Reader, with our lips moving and breathing the words almost silently. Some words are back and forth or augmented or completed by us, so the priest says something and we say something in response, just like Psalms are sung antiphonally. The most common response occurs in the many litanies, and that’s “Lord have mercy”, which we pray ad infinitum. – Prayers called “secret prayers” (which doesn’t mean secret per se, but “secret” in the classical sense refers to any prayer said privately) when said by the Priest or Bishop are not audible to us, and occur behind the Iconostasis (icon screen in the temple), and we are praying other prayers at that same time anyway, so no issue comes up there – you can pretty much grasp quickly what seems good to pray with and, if it does, pray it – you won’t hurt anything. – The word “choir” actually refers to the *entire* congregation – it means “the people” – basically everyone not currently serving the liturgy – so even though there is also a learned choir occupying the two side wings of the church (the church is shaped like a cross and/or an ark inside), when they sing, we also sing with them, not just listen. Not everyone realizes this – a lot of new Protestant converts or visitors think we’re supposed to be quiet and let the “choir” sing but not at all – the liturgy is sung and there are no professional prayers that do it for us. We sing as the choir, and the designated choir is normally an *aid* to help us keep the correct tone for the day and because we don’t all know the words, but learn them by liturgizing over the years. After all there are no “hymnals” – we are not “people of the book” but a liturgical community. The majority of hymns, though, are the psalter, so if you know the psalms, it’s fairly easy to follow even if you’ve never sung anything else with us. And we’ll also sing the Beatitudes, and a whole variety of other scriptures that day. For us, the Scriptures are a liturgical instrument, not a textbook. This is actually how we learn the scriptures, by singing them and continually. Keep in mind, we are also the instruments, the human and rational instruments fit to offer the fullness of praise to God, hence there are no guitars or trumpets. Some Orthodox churches have organs, but not the ones where I usually go to liturgy – those tend also to have pews and so of course people who aren’t standing are often not engaged in a full body experience, nor acting as the choir and potentially not praying along, because the organ takes their place, often loud enough to drown out thought. I prefer the tradition as I understand it, the keeping of which is piety itself. Generally, in the Diocese of the South of the Orthodox Church of America (OCA), you don’t find organs in common use. 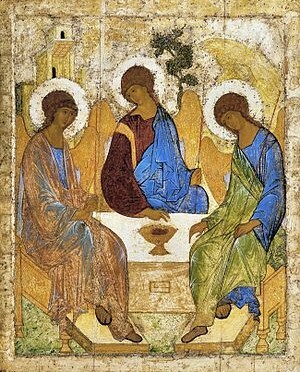 – An Orthodox person crosses himself by joining the first two fingers to the thumb, which declares the Holy Trinity, with the second two fingers free, declaring the two natures of the Incarnate Christ. Then he touches forehead, abdomen/belly (the bowels), right shoulder, then left shoulder, then briefly the ground, which action stands in place of a full prostration at times where it would bog things down to prostrate oneself continually (which is almost always). Full prostrations occur during certain times, though, notably during some Holy Week liturgical services. It’s helpful to understand the meaning of touching the ground in that way, as intending prostration of the whole man. – It’s appropriate to cross oneself to venerate an icon, including the Holy Cross, which is an icon, or the Gospels, which are an icon, or any holy object, and then to kiss the icon (not on the face, but usually humbly on the edge, or upon feet or hands), or also when praying at certain times (such as saying “Lord have mercy” or “alleluia”, or when referencing the Holy Trinity explicitly as the three Persons: Father, Son, & Holy Spirit), or whenever it is normally being done by most people in a liturgy or prayers, which reasons you don’t even have to understand to pick up fairly quickly. We also cross ourselves when passing a cemetery, or an Orthodox Church, or when mercy is especially needed (some of us do this when there are emergency vehicles or when an animal has strayed along the road or when someone is in distress), as well as in other times of prayer or during the appropriate prayers of one’s private prayer rule which is established with one’s own Orthodox father confessor, and which usually is a section of the communal liturgy or other common hours of prayer. If you don’t want to cross yourself, or can’t manage it, don’t worry about it. But you’ll find it does help with the flow of prayer if you intend to pray along (and not be bored out of your gourd) rather than be an observer and find the service long and exhausting. It’s always funny how “observers” who are literally merely spectating or watching the “beautiful service” are vastly more exhausted than the people actually doing the work of the liturgy, which is prayer, because they aren’t praying along. 🙂 Anyway, you’re not going to offend anyone by doing it “wrong” or not doing it – you just might find the liturgy less comprehensible, since it’s meant to be understood experientially by doing it. – The one thing I would advise is that if you say the (Nicene) Creed aloud with us, do not insert the extra clause the Roman Catholics (and hence Protestants) use, but if you don’t already know and say it by heart, that won’t be a problem of course. It’s usually only visitors from Roman Catholic or Protestant churches that might add in the extra words which are a heretical change, and they usually know that’s the one thing that would stick out like a megaphone and either omit them just as our fathers never said them, or else say them quietly to themselves, if they’re intending to remain Roman Catholic or Protestant. Just about anything else you could do would probably passed unnoticed, since everyone is busy praying, and you probably are too, or else you’re in agony from the sheer volume of content coming in from every inch of the cathedral covered by icons full of meaning, with the depth and intricacy of the liturgical prayers being said (sung), and all the visual and visceral things going on at once. So don’t sweat things in general – people likely won’t notice unless you open a hot-dog stand in the middle of things. – it’s Tradition, tho not all keep it, for men to stand on the side of the church where the icon of Christ is predominant (the right – the Christ side), and the women to stand on the Theotokos side, the left, where the icon of the God-Bearer predominates. This minimizes distractions between married couples (my wife and I always go to different sides) and between men and women in general. The idea is to minimize normal distractions that hinder prayer. For this same reason, it is traditional, though not all women do it, for women to cover their hair in the Church, since hair is a primary eye-catcher for men, even as an involuntary response, and the idea is to do nothing that would distract from continual and unceasing prayer. I’ll always stand on the right, but of course you’re free to stand or sit wherever. And if you’re back is troubling you, and the only spare bench is on the left, do it. – If ever in doubt of what to do, what to pray, and your goal is trying to keep the flow of praying continually without becoming an observer (observers never “get anything out of it” except incredibly distracted and usually confused, because the words don’t mean the same thing when not prayed) – don’t sweat it – the default thing is always to pray almost silently “Lord have mercy”, and you can cross yourself if you like (even if other people don’t, it’s ok). You really can’t go wrong with those two most basic things. The only time when crossing oneself could be wrong is approaching the chalice (because moving hands could knock the chalice) but only Orthodox Christians (meaning the Church has declared you Orthodox and received you to communion, not that you’ve adopted a personal preference or private feeling of affinity with the Church) who have likewise prepared themselves by fasting and a recent confession (i.e. not all Orthodox will partake of the gifts each time). So other than that, and you would learn a way to hold your hands at the chalice anyway, so you don’t cross yourself by accident out of habit, it pretty much can never be a wrong thing to cross oneself and say “Lord have mercy”. And then usually you’ll find it easy to return to the flow of things. – It is not normative to leave immediately after Communion, even if some people (or a lot) do so, and even if one does not partake of the gifts. The post-communion prayers are not, for Orthodox Christians, normally optional. While a more heterodox attitude might be to show up for communion to partake of the gifts and then take off, the Orthodox attitude or mind is there for the fullness of prayer, which is expressed in the entire liturgy. Giving thanks for the gifts one receives at communion could never really be optional, and the Orthodox mind views the entire liturgy as communal, rather than the bare/reduced act of the chalice alone, which is a more heterodox attitude. For that reason too, even those who don’t partake of the gifts, rightly remain and give thanks for them. If you have to go to the bathroom during the liturgy, you can – it happens to all of us, but general advice is go before at least, and we usually hold it if possible during the Communion at least, because of the solemnity of what is taking place. If someone comes late, and communion is occurring, they usually don’t even enter the Church proper but remain the narthex, while those in the Church do not move about at that time. – Attire for men is usually pants (not shorts), any kind of shirt (but usually not one with logos, advertisements, or messages on it – we’re not showing up to proclaim that Winger “rocks”), no watch (we are in the timeless place – upon entering the temple, we have also entered the temple in Paradise, because there is only and can only ever be one temple) and no cell phone vibrating or beeping (distractions). – While only Orthodox people who have prepared properly may approach the Chalice (for Communion) and, after they do, it is normal for them to cleanse their palates with a little ordinary blessed wine and ordinary blessed bread, there is a time when ordinary blessed bread is offered to all present, Orthodox or not. If blessed bread (which comes from the same loaves as communion bread, but isn’t the Holy Gifts) is offered toward the end of the liturgy, not during communion, but afterward, around the time of the dismissal, feel free to partake of it. Blessed bread is what it sounds like – bread that has been blessed. But generally, because it’s blessed, we do not throw it in the trash, and try to avoid dropping it on the floor, wasting it, or not consuming what we take. The Hours (these are the normal prayers that occur throughout the Orthodox day – they are monastic prayers, because the Orthodox ethos, or in the West someone might say “spirituality” is ascetic and comes from our abiding connection and root in ascetic life. We pray monastic prayers, keep monastic fasts, and pursue a monastic ethos and means of salvation. During the hours, the Proskomide (preparation of the offerings), which is the preparation of the communion “gifts” (the bread and wine), is being done behind the iconostasis to the side of the altar by the priest. So multiple liturgical things are, as almost always, happening at once. The Liturgy of the Catechumens – this is essentially the liturgy of catechesis (education) of those (catechumens) seeking to enter into Orthodoxy, which includes all Orthodox Christians as well, who are all also lifelong catechumens. We sing troparia (hymns) for the particular feast day and saints on this day of the Orthodox Calendar (rather than a religious calendar with Christmas, Easter, and a lot of white space, all the days of the Orthodox calendar are filled with multiple things). Our history and our current religious life are inextricably linked. The Holy Gospels are brought in (this is called the Lesser Entrance), the same way we brought the Torah out of the Ark for veneration before our Messiah came, and the Gospels are venerated, brought from their traditional place of hiding in the altar (where we kept them during the persecutions). Then we have our Readings for the day, which begins with the Epistle (as the Apostle instructed, the Epistles are read aloud in the Churches). Then the Gospel is solemnly read. The Liturgy of the Faithful – this is the liturgy of the Orthodox, and begins with the singing of the Cherubic Hymn, the cherubikon or song of the angels. “We who mystically represent the Cherubim, and sing the thrice-holy hymn to the life-creating Trinity…” The priest at this time, while we are singing, is preparing the altar and continues to prepare himself through prayer and asking forgiveness of the faithful, culminating in the Great Entance, which is a procession with the holy gifts. The gifts are returned to the altar, and Holy Communion begins, which we don’t generally discuss in detail, but there is a lot going on during this time, and it involves our most solemn activity during the liturgy. The Dismissal – we pray prayers of thanksgiving for the holy Gifts, and other prayers concerning our intentions for our lives as we are intending to go out, and for our relationship to the world. We share more ordinary blessed bread, and then we begin the post-communion prayers. The Post Communion Prayers – After the dismissal, while the priest is doing the last things that need doing related to the Holy Communion, the faithful are praying our most common prayers, in concert with the Reader, and praying the Psalms and, as always, for mercy. When these prayers are complete, we leave the Church proper, quietly and solemnly, it remaining a place of prayer, venerating the icons the same way we did upon entering. – Besides the psalms, the most common prayers will be litanies, and the most common phrase in any Orthodox liturgy, said hundreds of times, is “Lord have mercy”. Notably, we say this at every petition in many of the litanies. A litany (or ektina – but who needs technical terminology?) is a sequence of supplications which, as part of the liturgy, are intoned by a deacon or priest in the name of all those praying (we pray silently along). After each petition, the choir (the people) add, “Lord, have mercy,” or “Grant this, O Lord”, or “To Thee, O Lord”, as appropriate to the petition. After the supplications, each litany concludes with an exclamation (doxology) said by the priest glorifying the Holy Trinity (again, we pray silently along, and then add the “Amen”). The Litanies are prayers for all the world (the sick, the poor, the suffering, travelers, nations, peoples, and so on) as well as for the whole community (all who labor and work in it, all who are sick, all who… etc). Essentially it is all those things we have written in Scripture that we must pray for. The Great Litany (it is long and important) is the first one. To each petition we add “Lord have mercy”. There is also the Small Litany, which is abbreviated. The Litany of Supplication is a litany of completing our prayer to the Lord for that liturgy. The Litany of Fervent Supplication is particularly fervent, with a threefold “Lord have mercy” accompanying each petition, and it is often augmented with special petitions, for intense needs of the community (someone is very sick, etc). The Augmented Litany is the petitions from the Litany of Fervent Supplication with the petitions augmented by imploring God to attend to them. This litany might also be augmented with special petitions related to current events in the world or people’s lives, as pastorally needed. The Litany for the Departed is for those who have fallen asleep (died) in Christ. We pray for them, because Death is not a barrier between us and them, and they are our own, and we are theirs, and they pray for us likewise. The Litany for the Catechumens happens at the end of the Liturgy of the Catechumens, of course, and is followed by the first Litany of the Faithful, at the beginning of the Liturgy of the Faithful, as one could predict. The Litany of Thanksgiving is a litany that includes thanksgiving. Litanies are pretty simple, but highly elaborated. – If you aren’t praying along, religious culture shock (this is really a religion, not a religious philosophy, an asceticism, not a belief system) might eat you alive. If you are, probably not, because man was designed to pray, and it begins to become a cadence for the human person, once the ancient way is rediscovered. You will only likely be surprised then by two aspects of the prayers, aside from the richness of content, the depth of it, etc – one is the amount of repetition (it’s not really an amount – every repetition has a purpose – even the number of repetitions signifies something – saying something 40 times or 12 or 3 matters, in other words). The other thing is the veneration given the Theotokos. It is continual. Any time we may be speaking to, lauding, or venerating “Thee Our Champion Leader”. She will be addressed as many other things that may not be readily clear to people who don’t read our Scriptures the way we do (e.g. the Old Testament). She is The New Eve. The Ark of the New Covenant. Sanctified Temple. Rational Paradise. etc. One of the charges against the heretic Nestorius was that, in order to deny the Incarnation of Christ by denying the Theotokos as Mother of God, he reinterpreted many of the prophesies of the Scriptures (the Old Testament) in order to apply them to Christ or Christ only where the Christians (e.g. the fathers of the Church and the consensus patrum) had always understood those words to be speaking of the Theotokos. She is the Ark of the New Covenant, and Christ is the New Covenant, the Law written on our hearts. She is the New Eve, and he is the New Adam, redeeming Adam and restoring us to Paradise. But Nestorius found ways to reinterpret the mother of God out of the Scriptures almost entirely, to fit his claims against Christ himself, denying that he was one person, two natures, both God and man. It’s not by accident that Protestant understandings of our writings (the scriptures) make use of this same technique today, calling “Mary” the mother of only Christ’s humanity, which effectively divides Christ into two persons rather than one person with two natures. But as we venerate the Incarnate Christ, we therefore venerate the God Bearer, the Burning Bush that is Not Consumed. The Portal. The Heaven. The Earthly Paradise. Her womb more spacious than the heavens, because it contained, by a miracle, the uncontainable God. If you have a Protestant background, it might make you a bit uncomfortable facing this in the Orthodox prayers – if I were to predict one thing that would be most surprising to some Protestants in terms of content (remember, about 75% of things are sung), it would be this. Don’t feel pressured to think as we do. After all, you’re not us. Questions about things like that can be postponed. Just remember that you are hearing those who authored the scriptures singing of their meaning, not doing archaeology from “the original Greek” and not taking them out of the context of the community that wrote them, with the fullness of *all* that it is saying and doing, and was before it penned even the New Testament, which incidentally is replete with quotes from our liturgics, as well as the other way around. It’s helpful to get a dose of that, if one is thinking about where all this came from in the first place, and the community out of which it came. – If we say words in another language, it will be something that is so traditional that all Orthodox know what it is – for instance kyrie eleison for “lord have mercy”. Most liturgies in the US are in English unless that particular parish was founded to serve a particular diaspora or immigrant community in a particular language. Don’t sweat it or think you have to learn a new language, if there are some ‘foreign’ words in the English liturgy. Remember, Orthodox don’t have to go citing “the original Greek”, because the original Greeks are still Greek Orthodox and have never ceased to speak the language they created out of Hellenic Greek to contain the liturgical concepts in the Scriptures and other books of prayer. But some phrases and words are so venerable and beloved that we say them sometimes in Greek or Russian, for instance. – If you wish to greet the priest, e.g. at coffee, don’t hesitate, and don’t sweat how you approach – he’s used to visitors, but Orthodox don’t shake his hand – instead, we touch the ground simply, open our hand to receive his, and then kiss it when he extends it. If you don’t feel comfortable doing that, or don’t get how yet, just say hello. – That’s about it – if you’re nervous, there’s no reason to be, because we have visitors all the time. And feel free to disregard these notes. The advice portion is just an opinion, not some official dictate by anyone. I provide them because, for some people, they clarify the most notable superficial things, so they can enjoy the experience of much deeper things that are also notable, without getting caught up in the basics of what’s happening around them.